To some of us, Halloween is an enjoyable time to dress up our children and/or ourselves, carve scary pumpkins, decorate our home with spooky effects, gorge on treats, and spend the next morning jogging off a candy binge. To others, it is a time to figure out how much candy they need to have on hand to avoid cleaning toilet paper out of their trees the next morning. Regardless of what you do the morning after Halloween, with these simple steps you can wake up with a thicker wallet than usual, and not just from hiding Hershey’s Kisses in it. Buy Bulk Candy – You can save tremendous money by buying individually wrapped bulk candy instead of the overpriced brand name assortments at your grocery store or pharmacy. Do make sure that you buy individually wrapped candies; parents will (and should) shy away from letting their children try loose candies because of tampering concerns. Make Your Own Costumes – It takes a little more thought, but you can come up with creative ideas for your children’s costumes without having to go to the party store and purchase a pre-packaged costume. Get your kids involved in the creative process, and prepare to be amazed at their ideas. As for you, what if you don’t like to dress up at all? Get some spare tax forms and go as a tax collector. How frightening is that? The point is that you can come up with something clever without an elaborate costume. As a result, you will be more comfortable at the Halloween party, appropriately warm, and not burdened by the realization that your elaborate costume makes it impossible to use the bathroom. Make/Recycle Decorations – You can save significant money by making your own Halloween decorations out of inexpensive craft materials and leftover project materials you may have around the house. Old boxes, construction paper, leftover fabric or worn-out clothes… with a little glue, paint, and markers, they can be made into tombstones, spiders, ghosts, and other timeless classics. Use Thrift/Dollar Stores – Why pay more than you have to? Thrift shops are full of costumes and decorations for the creative-minded soul at rock-bottom prices. Dollar stores also stock seasonal bargains and are a great source for simple decorations or the materials you need to make them. Go early, or the selection will be picked over. Pool Your Resources – Find a group of friends with whom you can share decorations and costume pieces. It’s a great way to get more life out of materials without doing the same thing every year. Take Advantage of Post-Halloween Discounts – It won’t help you this year, but stores will be clearing out their costume and decorations shelves the day after Halloween to expand the Thanksgiving and Christmas displays. You can pick up great bargains to store for 10/31/2019. You can also pick up Halloween candy at a discount, but don’t kid yourself into thinking that will last more than a week. Show up as soon as the store opens and be prepared for hand-to-hand combat in the candy aisle. The day after Halloween is Black Friday for candy addicts. Get an extra level of Halloween enjoyment this year by having a great time and saving money in the process. 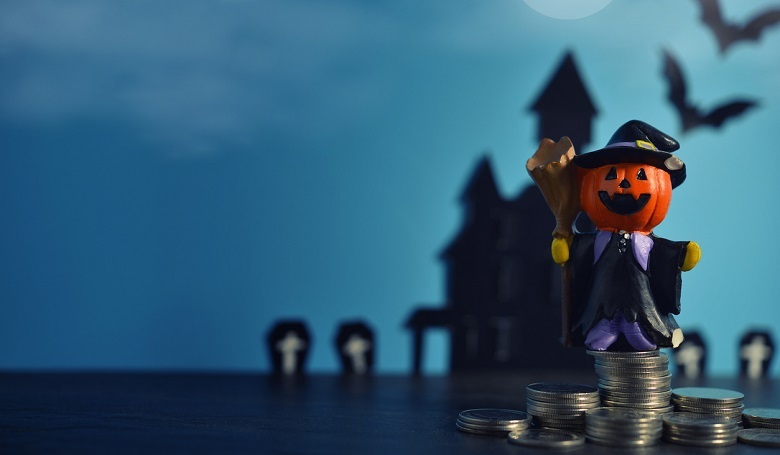 You will enjoy the glow of a fatter bank account, and you probably will not feel nearly as guilty when you raid your children’s Halloween candy after they go to sleep.